Thank you for choosing our dental team as your trusted healthcare providers. We look forward to meeting you and creating your rewarding dental experience. For your convenience, you can complete new patient forms online. This will save time at your first appointment and allow our office team to prepare for your visit. Please click here to complete your new patient forms. Your customized dental experience will begin at your first visit. When you arrive, we'll take you on a tour of our office. Dr. Cheng, Dr. Thorburn and Dr. Tijerina will perform a thorough, hour-long exam, including oral cancer and gum disease screenings, bite assessment, and an evaluation of your teeth. We'll take digital X-rays, which emit up to 80% less radiation than traditional radiography. A virtual tour of your mouth with an intraoral camera will let you view the condition of your teeth and gums alongside the doctor. Your dentist will discuss his findings and explain the photos so that you can make wise decisions about care. Then he'll work with you to develop a personalized treatment plan that will restore your oral health and meet your goals. The Hulen Dental team is dedicated to using advanced dental technologies to provide safer, faster, more comfortable dental services. 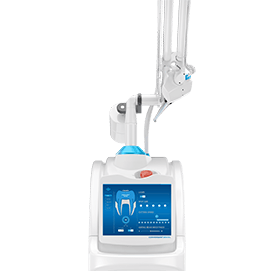 The Solea laser is one of the technologies we have incorporated that is utilized in many of our treatments, and we are one of only 700 dental offices in the US that offers treatment with this high tech laser system. We can use Solea lasers as part of the preparation for a number of restorative and cosmetic services, making it possible for you to receive many treatments without the use of injected local anesthetics or dental drills, making treatments much more comfortable. We can also perform soft tissue treatments with minimal bleeding throughout the process and shorter healing time with decreased chances for infection. In addition to providing outstanding dental care, you can also count on your Hulen Dental team for customer service. With this in mind, our front office staff will be glad to file all of your dental insurance claims, although we are not an in-network provider with any plan. By filing for you, we help you receive the maximum benefits available for any covered procedure. All dental benefits plans vary somewhat, but they do tend to have certain basics in common. Most notably, your benefits probably expire at the end of a calendar year, and they do not roll over. In this way, insurance carriers encourage subscribers to use their benefits for covered services, which largely include preventive appointments. Good oral health care is largely dependent on prevention. However, if you don’t see your dentist in Fort Worth regularly, then preventing dental disease such as tooth decay becomes more difficult. Therefore, it makes sense for you and your family to schedule biannual dental checkups, which are typically covered by most dental insurance plans. If you have any questions about dental insurance, your plan, or the benefits you are entitled to in connection with any particular procedure, please call our Fort Worth office today. Our Fort Worth office is located near Burleson, Crowley, and surrounding areas.